DELAFIELD, Wis. (Stockpickr) -- U.S. equity markets are once again under selling pressure today, with the Dow Jones Industrial Average trading down by 30 points, the S&P 500 off by 3 points and the tech-heavy Nasdaq trending lower by 11 points. Despite this weak action in the broad markets, there are still plenty of stocks that are bucking the downtrend and moving higher. The small-cap world is where I like to turn my focus on down days like today, since it's very easy to find stocks and sectors that are displaying relative strength and have actual buyers. One area that's been showing some relative strength of late, especially today, is the alternative energy complex and the energy-saving and infrastructure product players. Just take a look at the performance of NF Energy Saving (NFEC today, which is ripping ridiculously higher by over 90% with monster upside volume. Volume today has already surpassed 2.78 million shares, which is well above its three-month average action of 78,928 shares. NF Energy Saving manufactures flow control systems and industrial valve components for use in thermal and nuclear power generation plants and national and regional water supply projects, as well as municipal water, gas and heat supply pipeline networks. This company also specializes in energy saving technology consulting. Another name in the alternative energy space that's exploding higher today is Acorn Energy (ACFN, which provides technology-driven solutions for energy infrastructure asset management worldwide. This company offers oil and gas sensor systems, a fiber optic sensing system for the energy, commercial security and defense markets. Shares of ACFN are ripping to the upside today by 30% with heavy upside volume. Volume so far has registered 1.94 million shares, which is well above its three-month average action of 212,912 shares. Three more alternative energy players, all based in China, that are ripping to the upside today are THT Heat Transfer Technology (THTI, China Ming Yang Wind Power Group (MY, and Andatee China Marine Fuel Services (AMCF. As you can see from these examples, the alternative energy and energy-saving infrastructure players are ignoring the market weakness and finding real buyers. This sector is in play with the bulls, and money is quickly flowing into other names as traders look to find the next big winner. One alternative energy player that I am noticing today that's displaying some relative strength is ZBB Energy (ZBB, which is a leader in the design and manufacture of advanced energy storage and intelligent power control platforms that effectively enable integration of renewable and conventional energy sources. The company's products are used in grid-tied and grid-independent configurations for a number of applications and markets. This stock has been on fire so far in 2014, with shares up sharply by 114%. ZBB Energy is a speculative company with a market cap of just $46 million and an enterprise value of 33 million. This company recently completed a secondary offering of 6.32 million shares of common stock at $2.25 per share for a total of $13.1 million in cash. Shares of ZBB are now trading below that offering with the stock changing hands at around $1.90 per share. During the company's latest earnings report, ZBB Energy reported that product sales dropped sharply by 59% to $822,318 from $2.01 million during the same quarter last year However, engineering and development revenues spiked sharply by 650% to $750,000 from just $100,000 in the same period last year. License revenues for the quarter came in at $3 million. ZBB Energy's product gross margin for the most recent quarter was 33% compared to 12.8% in the prior quarter. The firm reported a much improved net loss of $67,945 vs. a net loss of $2.82 million for the previous quarter. I like the fact that ZBB Energy's secondary offering is out of the way, so now with the sector on fire this stock could very easily be the next name that traders come after. 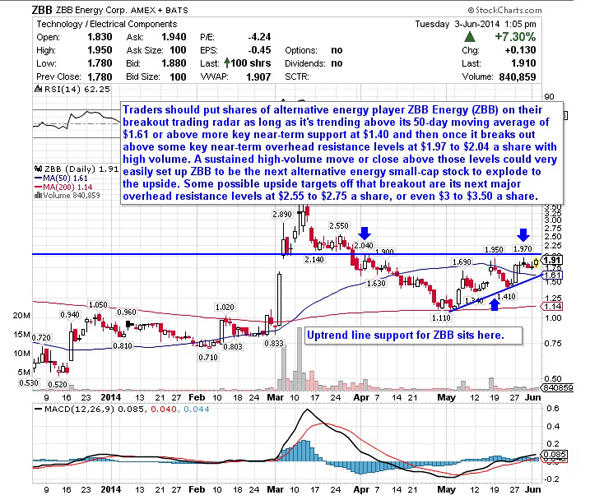 Shares of ZBB Energy could very easily explode higher from current levels, and the chart is setting up technically for just that type of move. If you consult the chart for ZBB Energy, you'll notice that this stock has been uptrending strong for the last month, with shares moving higher from its low of $1.11 to its recent high of $1.97 a share. During that uptrend, shares of ZBB have been making mostly higher lows and higher highs, which is bullish technical price action. This recent uptrend has also started at ZBB's 200-day moving average and it's now pushed shares back above its 50-day moving average. This move has also reversed ZBB's previous downtrend from March to May and the stock is now firmly in a new uptrend. This action of late is quickly pushing shares of ZBB within range of triggering a major breakout trade above some key near-term overhead resistance levels. Traders should now look for long-biased trades in ZBB as long as it's trending above its 50-day moving average of $1.61 or above more key near-term support at $1.40 and then once it breaks out above some key near-term overhead resistance levels at $1.97 to $2.04 a share with high volume. Look for volume on that move that hits near or above its three-month average action of 1.60 million shares. If that breakout triggers soon, then ZBB could very easily be the next alternative energy small-cap stock to explode to the upside. Some possible upside targets off that breakout are its next major overhead resistance levels at $2.55 to $2.75 a share, or even $3 to $3.50 a share. The bottom line: The alternative energy complex does not care about the market weakness today, especially in the small-cap arena. This sector has real buyers and some huge winners, and the chart for ZBB Energy is quickly setting up to potentially be the next explosive mover to come out of the sector. All we need is for ZBB to trigger that breakout I outlined above with strong volume, and then this stock could easily be off to the races in a flash. Be ready for it if we get it.